With so much choice out there it can be difficult to decide. If you are looking for your first wine cooler or adding to your existing cooling system, Vinotemp provide several models that can fit the needs of the novice and expert alike. Vinotemp markets itself to high end buyers and because of this has many beautiful coolers in several different sizes. While the brand focuses on larger capacity coolers, they do have a few lower capacity models, a traveling wine cooling bag, and some wine coolers that dispense wine without having to take out the bottle. If you've been growing a wine collection for a while it may be time to move up to a larger, better quality wine cooler. Vinotemp offers these in single and dual temperature zone wine coolers. Our in depth look at Vinotemp wine refigerators will help you navigate whether or not they are right for you. We looked at five different modelso of various capacities and features to provide a great overview to help you in your research. The chart below summarizes five different Vinotemp wine fridges focusing on commonly sought features. Below the chart we've provided a more in depth look at their cooler range across the brand. If you're new to wine you might not know what the various features are? What should those new to wine look for? What features matter and which are secondary? Check out our descriptions below to deepen your understanding of what to look for while shopping for a new wine cooler. Bottle capacity is one of the first things to think about when shopping for a wine fridge and like the name suggests, is the amount of bottles a wine fridge can hold. Try to keep your wine fridge at capacity to ensure that it cools to the right temperature and is also energy efficient. Stuffing a wine fridge can result in it opening, causing it to run too much and allow your wine to warm up. Most models have removable shelves to allow for upright standing or extra large bottles to be kept. Quick Tip: When shopping for a wine cooler, size really does matter. You want to be able to keep the same amount of wine you usually have in the house rather than leave it partially empty or have leftovers - this helps with efficiency. You don't want to have to run out and buy all kinds of extra wine just to fill it, either. We recommend only getting a fridge that holds wine and keeping other beverages in your regular fridge. If you plan on building a collection, consider a wine cooler that holds a minimum of 30 bottles. If you are not one to save or collect, a 12-15 bottle capacity wine fridge should fit the bill. You can always start small and add a cooler but you'll notice a difference in your electricity bill so try to plan well. And don't forget that once everyone sees you have a wine cooler you're likely to have several bottles of wine come your way when you host parties, have a birthday, or celebrate other holidays. There are two ways wine fridges cool - using a compressor or thermoelectrics. Vinotemp offers both styles and both have their perks. Great for those with, or starting, a serious collection. Quick Tip: Thermoelectric is one of those features that sounds great on paper and is probably great for a small amount of wine that doesn't need to be that cold (reds), but in the long term, a compression based wine cooler is the way to go. While thermoelectric may sound like a better option due to the low amount of noise, everything is just relative and the compression based fridges aren't terribly loud. Compression based fridges are best for storing a variety of wines. Another reason we like compression-based wine coolers? If you live someplace that gets warm, or keep your heat up high, thermoelectric wine coolers are more sensitive to the temperature of the room (ambient temperature) and will warm up. Compression-based fridges can do this, too, but aren't nearly as sensitive as their thermoelectric counterparts. 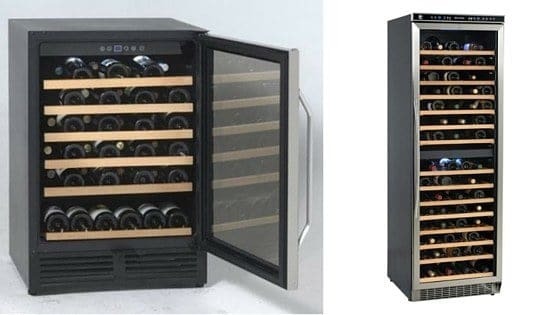 Some wine fridges have two separate areas - one that stores wine at less of a range, and one that gets colder for storing whites, sparkling wines, and other beverages. Quick Tip: Vinotemp has dual-zone wine fridges that have shelves for wine bottles. Most brands have the colder zone set up for juices, sodas, and other mixes. The larger the fridge the more energy it uses so avoid dual zones that have space for beverages you could store in your regular refrigerator. Did you know that heat and light are two of wines biggest enemies? In addition to oxygen these are the trifecta of things wine hate. A wine fridge with UV doors can help keep your wine protected from sunlight and its harmful UV rays. If you can't find a fridge that fits your needs with this type of glass, be sure to keep it in an area that is not exposed to sunlight. Vinotemp has been in the wine industry since the 1970's and making wine fridges and coolers since 1985 when they started in Los Angeles. While they started with and continue to make wine coolers of all sizes they also make cigar-related products. Vinotemp has been recognized by the industry as an exception business run by a woman and for their design innovations. The look of their products is attractive, modern, and they fit into any wine space. In addition to smaller coolers, like those we have reviewed, they also manufacture cellar systems for commercial spaces or residential collections of substantial sizes. Read on for the detailed Wine Turtle take on VinoTemp wine refigerators. Summary: Vinotemp offers a huge variety of cooler options for the many different types of wine drinkers. Whether you want a small or large cooler, with one or two zones, you're going to be able to find something in their line that suits your needs. The traveling wine cooler is also a fantastic option that people really seem to like. Vinotemp has short warranties but their customer service department is responsive, especially when customers post negative reviews of their products on social media or other websites. Hey, the squeaky wheel gets the grease, right? Compression Cooling - Wine needs to be cold, and at least cool (no, should shouldn't store and serve reds at room temperature!). Compression cooling is the best way to do this. It is also longer lasting than thermoelectric cooling. VInotemp offers both types and we appreciate that because we doubt we'll leave our compression based wine coolers by the wayside ever. The Look - These are beautiful coolers with designs that fit a variety of aesthetics to blend into any cellar, apartment, wine room, or dining room. Choice - There are a variety of options when it comes to these coolers. Customer Service - ​Vinotemp checks their reviews online and does help customers who run into issues - even instances beyond their super short warranties. The Three Month Warranty - Three months is too short for a warranty. A wine fridge is an investment and meant to hold collected wines, some bottles which made be held for years, not months. The warranty should be at least a year and there should be options to extend it further. How Does The Pricing Work? - It's unclear how pricing works with these wine coolers - with some larger ones being offered at a great value and some small coolers priced very high. It's important to have consistent, value-based pricing. Inconsistent Quality - The performance of these coolers is all over the place. For a company that specializes in wine coolers, we would expect that they would have consistent quality and that that quality would be good. It's not as if they were manufacturing humidors and then attempted a wine fridge. Instead, they pride and market themselves as a wine cooler company - so we're not sure why things are all over the place. One reason is that their larger capacity coolers seem to rank higher so this may be a better brand for those with a larger wine collection. Vinotemp offers several options for those looking to invest in a wine cooler. Whether you have a tiny space or a larger one there are different sizes to fit both your space and your wine storing needs. Look to the higher rated options which are their larger coolers and you should be all set. Need a smaller cooler? Vinotemp may not be the best brand for you. Make sure to check back soon for more Vinotemp wine cooler reviews. Make sure to follow us on Facebook or join our mailing list to see articles like this on a regular basis!